Are you thinking of bringing a tiny new Pug puppy into your family’s home and hearts? Should I buy a Pug? In this article we take a look at the increasingly popular, totally adorable Pug breed of dog. Giving you a complete guide to his temperament, characteristics, health, care and special requirements. And helping you to make an informed decision about whether this charming little dog is the right one to bring into your life. The humble Pug has risen hugely in numbers in the past few years. 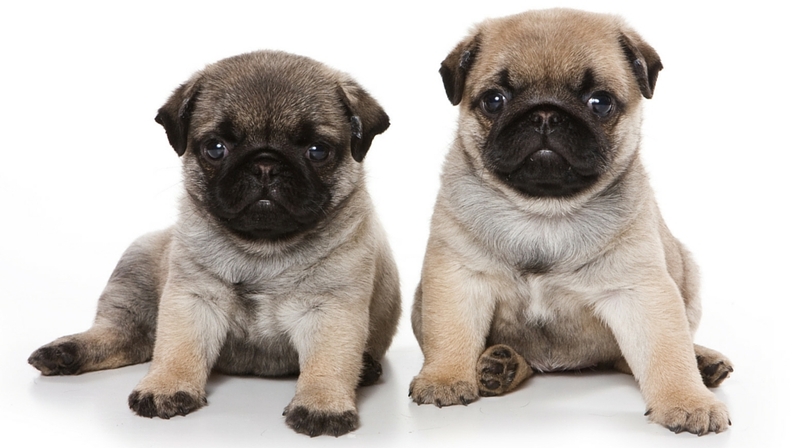 In 2004 there were less than two thousand pug puppies registered by the Kennel Club in the UK. But by 2013, less than ten years later, that number had more than quadrupled to over eight thousand puppies. [wp_ad_camp_5]The Pug isn’t alone in this changing taste in dog breeds however. 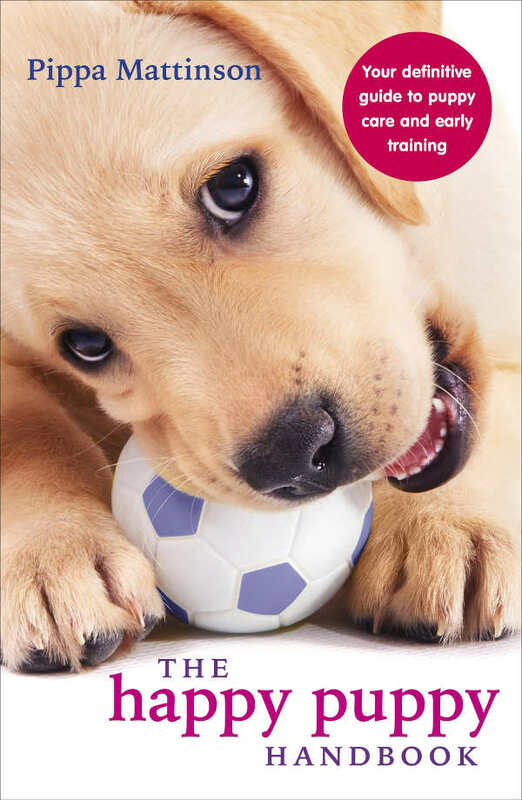 He belongs to the Toy Group of dogs, whose numbers in general have also increased in recent times, showing a rising interest in smaller pet dogs. Of course it isn’t just this general interest in toy dogs that accounts for this extraordinary 370 % increase in pug puppies being bought and sold around the country. And that’s just registered puppies. Many more are sold without Kennel Club papers, from unregistered litters. The Pug is a fairly ancient breed thought to be of oriental origin. They were first recognised by the American Kennel Club in 1865 but pugs were being imported from China as early as the 16th century. The passion for pugs in celebrity circles is nothing new. Pugs were specifically bred to be companions rather than for any practical purpose. And were popular with royalty and other historical celebrities. Prince William of Orange credited his pug Pompey with saving his life after the dog alerted him to the approach of the Spaniards. And Josephine Bonaparte reputedly owned a pug named Fortune. Early pugs were rather different in appearance than today’s pugs though. 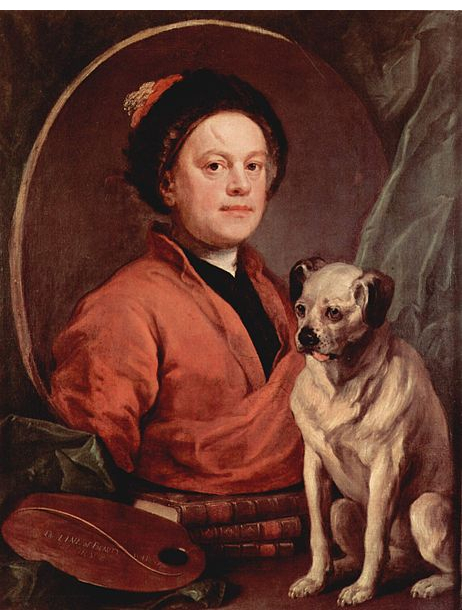 Have a look at the painting of William Hogarth and his pug below left. Here is a photo of a painting of a Pug in 1745. You can see clearly that this dog has quite a substantial muzzle. The extreme facial shortening we see today has been achieved by selective breeding over the last hundred years or so. 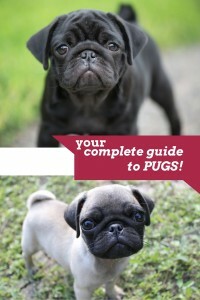 And the modern pug looks rather different, as you can see from the profile of the puppy at the top of the page. 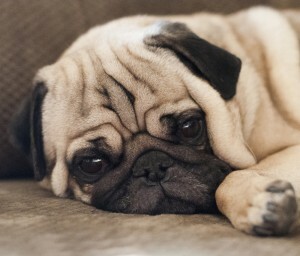 Sadly, selectively breeding for flatter and flatter faces, and for the characteristic ‘screw’ tail that the pug shares with several other flat faced (brachycephalic) breeds, has had serious consequences for these lovely little dogs, which we will discuss in the health section of this article. Pugs are well known for their charm and personality. In fact, they are hard to fault in terms of temperament. [wp_ad_camp_2]Pugs generally have delightful natures. They are friendly little dogs, good with children and adults alike. They are also compact creatures, fitting neatly into any sized home, and not requiring a great deal of outside space either. The breed is known for being deeply affectionate and loyal. This is a dog that loves spending time with his family. Making him a great indoor companion. Pugs are also fairly easy to train with basic household manners. They are intelligent dogs who are interested in interacting with people and usually happy to accept treats and affection in equal measure! It is these characteristics, together with their striking, flattened, almost human like face, and huge eyes, which have contributed to the breed’s rapidly growing popularity. But upsettingly there are some serious health concerns lurking behind this wonderful natured dog’s lovely personality. It saddens me greatly to have to start this section on a very negative note, and to let you know that Pugs are unfortunately not healthy dogs. In fact, some of the very aspects of the Pug which people find so appealing are actually indicators of serious underlying issues. For example the fact that pugs are low energy dogs is not because they don’t want to run around all day as much as other dogs – it is because they are simply not able to. Let’s take a look at why this is, and what you can do to help them. Overheating is the first of several problems that many pugs and their owners have to face. And it’s a serious concern, which you will need to consider if you decide to buy a Pug puppy. The muzzle of a healthy dog is long in proportion to it’s skull for a reason. It has two very important roles. The muzzle houses the complex system of ‘turbinates’ which bestow upon dogs the amazing ability to smell tiny traces of substances completely undetectable to man. More importantly, this muzzle provides a dog with an extremely efficient cooling system. If you have a Pug puppy, you can help by ensuring that he or she is never over exercised, or allowed to become too hot. Avoid going for walks in the hot weather, and make sure that you bring some water and have access to shade whenever you take him out. Never leave your Pug alone in the car on a warm day, the usual risk of overheating in cars which normal dog owners work to avoid is increased considerably with your Pug. Be constantly aware of the risks of your Pug puppy overheating and you should be able to counter its potentially life threatening effects. However, the problems don’t end there. The shortening of the Pug’s muzzle has an even more serious impact on his airways. One of the things people find charming about pugs is the endearing noises that they make, including a propensity to snore like a train! However, the cause of this noise is sadly anything but. When we were busy breeding pugs with shorter facial bones, we sadly failed to reduce the soft tissues of the pug’s face in proportion to his new smaller muzzle. This left pugs with a lot of spare flesh. Both inside and outside of his mouth. On the outside this tissue forms deep skin folds, which can cause problems too, but it is the inside of the pug’s mouth we are concerned with here. Inside the pug’s mouth, his soft palate has nowhere to go except into his airway. And pugs often have severely compromised respiratory systems. In more ways than one. These problems together are termed brachycephalic airway syndrome. And you can read all about them in the link provided. There are surgical options which can help some Pugs to breathe more easily in the long term, but considering whether to bring a puppy home who you know will be constantly short of breath is a decision only you can make. It’s important that you read this information if you are considering buying a pug puppy as brachycephalic airway syndrome is a significant risk and it will affect your wallet as much as it affects your heart. Being a pug does not just mean coping without a muzzle. It also means coping with abnormally shallow eye sockets. This is related to the shape of the pug’s skull, and happens in other brachycephalic breeds too. Shallow sockets means protruding eyes. And protruding eyes get scraped and scratched a lot more than they should. They are also prone to ulcers and infections because the dog’s eyelids struggle to close properly over an eye that is sticking out further than it should. There are other problems with brachycephalic eyes too, and you can read about them in this article brachycephalic ocular syndrome. You can help your Pug puppy to reduce these risks by being vigilant with their eye health. Inspect them every day for signs of discomfort, including rubbing, redness and discharge. Take your Pug to the vet immediately if you have any concerns. You probably know that the pug has a cute little corkscrew tail that curls over his bottom. It looks very sweet, but the screw tail can be trouble for Pugs and their owners. The feature that makes the tail lie in a spiral, instead of hanging down behind the dog, is a result of a deformity of the tail bones. Screw tails can also be hard for your Pug to keep clean. If you bring a Pug puppy home you will need to inspect and clean his tail daily, wiping off any grime that may have got caught up there. This will reduce the risk of him picking up an infection or getting too grubby. The pug has just as many teeth as nature intended. Unfortunately he has nowhere to put them. This is a common problem to several Toy dog breeds and by no means exclusive to the Pug. And it is something you need to be aware of as an owner. The number of teeth in a Pug’s mouth can cause overcrowding. The close proximity of the teeth means that food is more likely to get caught between them, leading to gum disease and tooth decay. Which in turn can cause problems eating. If you own a Pug, you need to take extra care of his teeth. Brush them daily, try out dental dog chews too. Frequent checks will allow you to see whether you are helping to keep them clean. You will also need to make sure he has regular check ups with your Veterinarian, who will be able to let you know how you are getting along. The main health problems we have discussed so far with Pugs are those related to conformation. How he has been bred to be shaped. 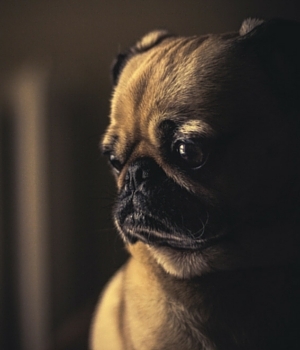 These problems are not exclusive to Pugs, but they are more severe in this breed than most. And they do not just lead to health problems, they can cause these adorable pups to be in constant discomfort. It is worth bearing in mind that although all dogs have health problems of some kind or another, these structural ones are pretty serious and must be taken into account when you are deciding which breed to adopt into your family. What is important, is that these conditions, some of which occur in other breeds too, are in addition to the 5 structural problems listed above. Those problems are specifically associated with the structure of the dog. A structure that is deliberately selected for and built into the Pug breed standard. Pugs are not alone in suffering from defects in conformation that affect their health. Several breeds of dog have problems specifically associated with their structure. This does not mean that these problems are unavoidable. Breed standards are, after all, written by human beings, and they can be re-written, if there is a will to do so. We don’t actually need to keep breeding dogs in the same way that we have been doing for the last few decades. It is a matter of choice, though not of course, for the dogs. The five problems outlined above are problems of brachycephaly. They are not unique to pugs, they are also suffered to a greater or lesser extent by other brachycephalic dogs. It’s just that we seem to have taken brachycephaly to dizzy heights with this particular breed. There is no doubt that owning a Pug has huge appeal for many people. But the health problems we have looked at here are not rare. In fact most Pugs will suffer from some degree of health impairment simply as a result of being deprived of a muzzle. Yet many new puppy buyers are unaware of the real extent of the Pug’s problems, until they have taken one into their hearts and homes. Sadly, many information sources that talk about Pugs, either play down the extent to which these little dogs have had their health impaired. Or treat the problems as inevitable. Which they clearly are not. And we’ll look at this a bit more closely below. If you go ahead and buy a pure bred Pug puppy, you need to read up on all of their health problems and learn how to help to manage them. You will find links to further relevant information at the bottom of this article. Be aware that the noises some Pugs make whilst they are breathing are not ‘normal’. They are a sign of respiratory distress and a sign that your dog needs veterinary attention. Don’t wait until your pug starts fainting or collapsing to get help. Early treatment saves lives and is more likely to be effective. Keep your dog out of the hot sun. Never over-exercise him. Check his eyes, teeth, face folds and tail at least once thoroughly every day for signs of ill health. 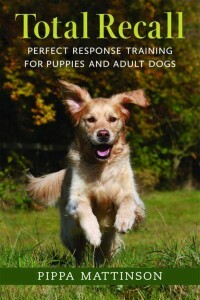 Book regular checkups with your Veterinarian to make sure that he is not suffering in silence. What does it mean to be a low energy dog breed? You’ll have guessed by now that most Pugs are limited in the activities that they can participate in, due to their compromised physiology. But bear in mind that inside every Pug lies the soul of a healthy dog. Your Pug doesn’t know he is disabled. Many Pugs will limit themselves with regard to exercise due to quickly tiring, but some do not pace themselves sufficiently and cause themselves problems. Your Pug may not be willing to restrict his own exercise enough to prevent fainting or collapse, nor be able to judge when he is running short of oxygen, or becoming overheated. So you need to make sure that he doesn’t over-reach himself and to make these decisions for him. Avoiding too much exertion especially in warm weather is essential. This breed is not a suitable companion for those that love long hikes or marathon running, and want to take their dog along. How can you help Pugs to get healthier? It is possible, with a careful breeding program, using only Pugs with straighter tails, longer muzzles and better set eyes, that over generations you could potentially claw back a healthy structure for this popular breed of dog. But this is probably not a reality. Particularly as some breeders do not recognise that they created a problem. There are two realistic ways to help Pugs become healthier. The first is the outcross them with a more structurally sound breed or breeds. Allowing them to have a healthier structure but retain some of their charm and delightful character. The other options is for people to stop buying Pugs altogether. Which is a sad thought, because of course some of those that love Pugs would hate to see a world without them. And owning a Pug may indeed be rewarding in a number of ways for the owner. But the question remains whether or not we should be continuing to breed at all from animals condemned to live a life of discomfort and ill health? Despite the lack of information on the pug health page on it’s website, the Kennel Club does acknowledge the problems caused by the conformation of these little dogs. It has set up a breed watch scheme and lists a number of high profile breeds on it, including pugs. You can follow this link to find out more about breedwatch, but it is thought unlikely that we can expect any radical changes in the pug’s conformation as a result. I hope that pug breeders will soon begin selecting for much longer muzzles. This is crucial to the pug’s welfare. Some judicial outcrossing to restore the muzzle to this breed as a matter of urgency, would be ideal, but I sense that is not going to be sanctioned by the Kennel Club any time soon. In the meantime, I do hope that if you are thinking of buying a pug, you will consider alternative and more healthy breeds before you make up your mind. If you are set on buying a Pug puppy, then I highly recommend getting a cross bred Pug. Go to a breeder who is committed to improving the health of these adorable dogs by outcrossing them to one with a better structure. Remember, some people breeding ‘designer crosses’ with names such as ‘puggles’, are just trying to cash in on a fashion. 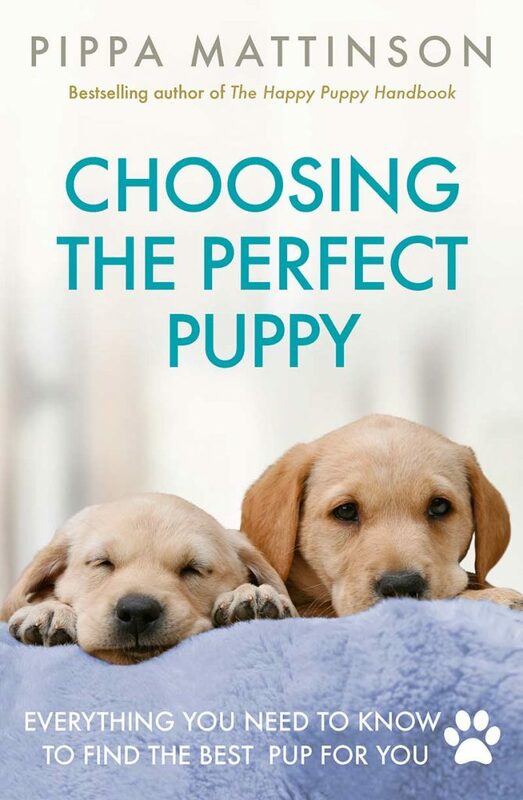 So you need to chose a breeder with care. 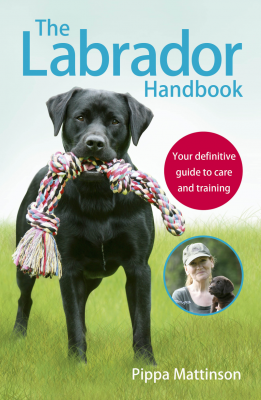 Ask a lot of questions of your breeder, such as why they chose to cross breed, what health tests they carry out and what characteristics they breed for. This will help you to ascertain whether the mixed mating was one driven by a love of the Pug type and a wish to breed a healthier pug, or for financial reasons alone. Pugs are wonderful little dogs. Lovable and loving, cute and endearing. But they are not the only breed with these characteristics. Lifespan is not a guarantee of freedom from suffering of course, but in general terms terriers and poodles are lively small dogs with no major abnormalities of the skull and skeleton and that are able to run, jump and breath freely . [wp_ad_camp_1]If you cannot bear the thought of life without a purebred Pug, perhaps you would consider rescuing one? Either from a Pug specific rescue or from a general dogs home. Although they do not come through the doors that often, I have seen Pugs on Battersea Dogs Home’s website for example a few times. Register your interest with local rescues and be prepared to wait for the right dog to come along. I have also included the list of resources I promised you earlier in this article. Whatever you decide to do, please read as much as you can. If you decide to buy a pug please insure your dog (it won’t be cheap). And build a good relationship with your veterinary surgeon. If you are considering buying a Pug or Pug cross, you will need to learn all about their special requirements. So that you can keep them as comfortable and happy as possible. We have a purebred pug, she is 6 years old, she is about 24 Lbs. Still active and a great dog!! We are having a problem finding a harness to fit her and have been using a collar only, which she can slip out of during walks if she wants to. We have tried various pet stores with no luck, I believe it has to do with the chest area if the body of a pig is quite large? Can anyone recommend something that will work in our situation. Thank you in advance for any help in this matter. This may sound strange, but worth a try. Find a Seamstress or Tailor and explain your situation. Take a few harnesses ranging in differen sizes, They make be willing to take chest measurements and possibly make the adjustments where your pug would no longer be able to slip out of.